Sometimes people around me wonder where I am. Maybe you have too. I used to say, I don’t travel much, but I realized that is because some of my colleagues travel even more… So I added a list of upcoming trips to the sidebar of my blog. You can also subscribe to my trips through dopplr. I hope this makes it a little easier to meet up with other people while I am travelling. 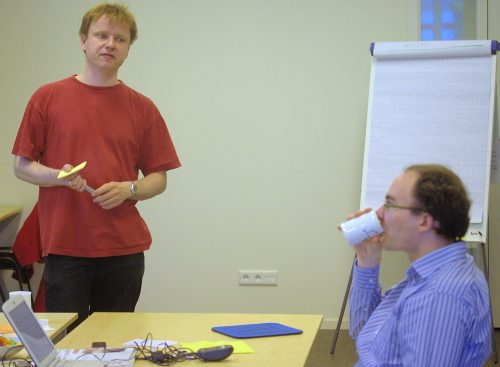 Helsinki, 29 October sees me and Marc Evers co-present the revamped “right-sizing your unit tests” workshop at the Scandinavian Agile Conference. The past years we toured conferences mostly with systems thinking and other people oriented sessions (e.g. cultural patterns), we thought it would be fun to give people a taste of our technical sessions as well. Eindhoven, 20 and 21 November – together with Bath, UK one of my home towns -, sees yours truly and Rob Westgeest with a demonstration of story testing with rspec at XP Days Benelux and Responsibility-driven Design with Mocking with Marc Evers and Rob. London, 11th & 12th December, I look forward to join Rachel Davies in co-facilitating the large open space at XP day London. It is already their eighth conference, and the XP day London organisers show courage by going with a completely different format – less presentations and more interaction between the participants through Open Space. I think it is fitting. As agile software development progresses, practitioners need a place to push boundaries and work on problems they are (still) getting to grips with. With the high caliber audience that xp day usually draws, this should make for interesting topics and lively discussions. That’s it for now. I will probably go to London and Bath somewhere in October as well. I don’t know when yet. Marc, Rob and I have been busy for a while, thinking about repositioning what is soon to be formerly known as eXperience Agile. We were feeling that what we are offering is more than ‘just agile’. We also want to reach pragmatists on the other side of the chasm, who don’t respond well to the zeal that seems to rear its’ ugly head around methods every once in a while. In short, We’d like a new website, so that our regular customers can easily find out which courses are forthcoming. We want new versions of the brochure, so that people can see the new courses, and we want to send out mailings more often, so that we can keep our clients and alumni informed on interesting conferences and new developments. There must be a system to all this, most likely similar to a tale of website traffic. And we’d like a new name and logo, so the brand fits better with our aspirations and activities. So we spent a day brainstorming new names, and finally found one that we all liked and had an available domain name that was not too long. If I remember correctly, Rob came up with the name and it fits well with the name of Marc’s company (Piecemeal Growth) and mine (Living Software), as it is also inspired by patterns. We also decided to do some experiments. We moved slowly, we were all available at different times and registering the domain name took longer than expected. One of the experiments we decided to do is sponsoring a conference with money – usually we sponsor conferences with blood, sweat, and tears (and a good portion of laughter of course). And then it took us a couple of months to get moving on it. We were procrastinating, because not ‘everything was ready’…Sounds like a software development project, doesn’t it . We did not have a logo, nor did we have the new website we wanted so badly – the current one is inconvenient to maintain and could look nicer. This week, I decided to get moving, even though the sponsoring deadline of the conference had already passed. Luckily, one of the organizers mailed me if we were still interested in sponsoring – I had talked to him at the agile2008 conference already. That was excellent timing. We felt we can always iterate over the logo and change it later. We also had to give them a url to the website. Oops. Ok, so we don’t have the flashy new site yet, but we have the domain name, so we point it to the old one for now. Ah. brochures. We should have something to hand out at the conference. Hm. The previous one was quite succesful, but we didn’t get around to making a new one. What changes do we really, really want to make so we can send it to the printer this week? Let’s take out the course schedule so the brochure lasts a bit longer, add a new course and announce the rebranding in the brochure. By now, I hope you are curious about which conference we are going to sponsor, what our new name is going to be, and what our new offerings are. Be the first to know, and subscribe to our – soon to be revamped – newsletter – leave your e-mail address in the box at www.experienceagile.eu or contact me directly. Credits: Thanks to Marc Evers for simplifying the text. Harald Walker shot a little video at Agile Open in June. He edited it, so that it became a nice little explanation of the Open Space “rules” in three minutes. You are currently browsing the me.andering – Willem van den Ende blog archives for September, 2008.